Scenario: I recently purchased 5 systems with Windows 7 pre-loaded and up-gradable to Windows 10. Since my Internet was slow, the up-gradation on one PC took nearly 5 to 6 hrs and you know it’s not going to be easy to do the same on rest of the PCs. So I decided to clone the 1st machine on to the rest of the machines using Acronis True Image software. After successful cloning, the new machines were booted up and to my surprise, the Windows 10 OS was not activated! This was because the OEM keys with which the first machine was activated was not the same on the other machines, obviously! But then the CD’s didn’t contain any keys, as the OEM keys were embedded in BIOS (and that’s how these days the machines are shipped). So I decided to extract the OEM/Product Key embedded in the BIOS and thankfully the software called ShowKeyPlus was of a great help. 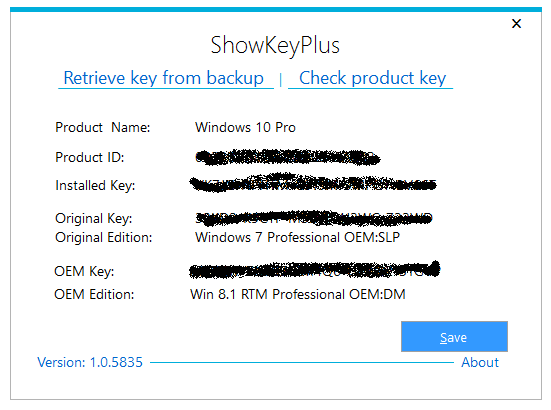 ShowKeyPlus is a graphical tool to view Product ID, Installed Key, Original Key, Original Edition, OEM Key and OEM Edition on Windows 7, 8 and 10. After downloading ShowKeyPlus, extract the zip file and run the executable to know the Windows OEM key. Apart from the key, the associated Windows Edition of each key is also displayed as shown in the below screenshot. And that’s it, now I have the OEM key to activate Windows 10. Thanks to Acronis and ShowKeyPlus which saved my day.